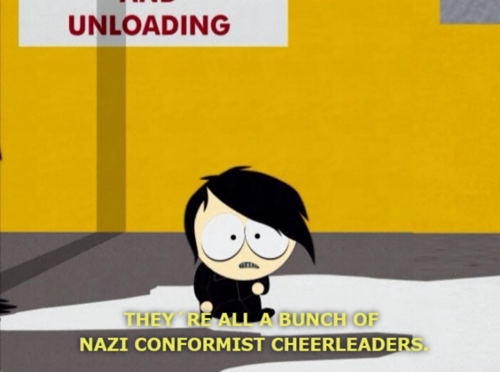 Because you know that life is full of pain and total conformists. 1. When they knew that the only way to deal with Hot Topic was to burn it down. 2. When they understood that dancing in public is a horrible, joyless nightmare. 3. When they got that there is nothing more bleak than being sent to the suburbs. 4. When they understood that even your friends are sheep. 5. When they understood that life is utter blackness. 6. When they got that parents are the anathema of happiness. 7. When they knew that the bleakness of existence can be totally badass. 8. When they understood that revenge is more sweet when you beat the conformists at their own game. 9. When they understood that pinning back your hair just makes you look like a wuss. 10. When they knew that calling someone an emo kid is a capital offense. 11. When they understood that making eye-contact is the worst thing a person can do to you. 12. When they got that the cold loneliness of life is best experienced in the rain. 13. When they got that love is just a fantasy for Justin and Britney wannabes. 14. When they understood that gym class is basically the 5th circle of hell. 15. When they got that happy families are a total Disney fairytale. 16. When they knew exactly what was wrong with all you happy, Banana Republic wearing haters.